Right from childhood, we are always advised to pursue one dream, one ambition, all in one direction. We are told to focus and channel all our energies into doing what we want to do most (keeping in the mind the respectability factor, of course), but it is only with time that we individually realise that all those advise over the years ultimately fell flat. As humans, change is the only constant characteristic we have, be it how we want to look like, or what we want to become, nothing is for life. Unlike our tattoos. Recently, I met up with one of India’s finest realistic tattoo artists, Rahul Ghare (of The Art Studio, Mumbai). We chatted for hours as we generally do whenever we catch up, but more importantly, what I could really take back from the conversation was a more evolved idea of tattoos. Rahul is our Artist of the Week, and through this article and the following video, we will try to give you a slight insight into the world of this mad genius. The first thing that really strikes you about Rahul when you meet him for the first time is his physique. For a tattoo artist, he is quite big, and at the same time, very polished. In fact, during the course of the interview, he tells us, “Body building was my first passion. Then came art.” But after he took up tattooing professionally, he could barely take time out for the body anymore. 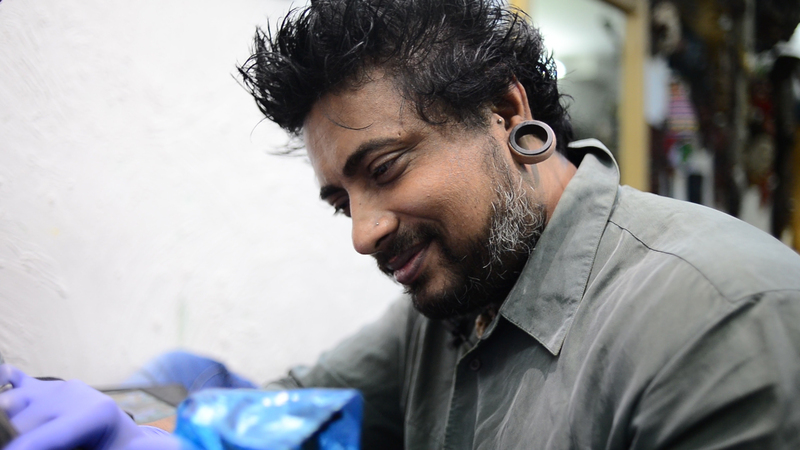 In fact, Rahul is a BA graduate, whose entry into the world of tattooing is a story of its own. Alike most artists you come across, he has had an instinct for drawing and sketching right from his childhood, but unlike most of them, artistry was never his first choice. Having got his first tattoo from Sameer Patange in 2001, Rahul didn’t give tattooing a professionally serious thought until 2010. As Rahul says, tattoos have to leave you with an emotion, or a ray of emotions. And that’s why, “Never rush into a piece. Take your time.” Your tattoo will last the distance with you. Give it the time it will give you back.